1 Disc Blu-ray (Distributor: Arrow Academy) Running Time: 130 minutes approx. If this is our perception of what an alien is, no wonder visitors to earth from another planet are unsure what being human is. Then again, humans can’t answer this question so what chance do interplanetary species have? Illustrator Narumi Kase (Masami Nagasawa) is called to the hospital where her husband Shinji (Ryuhei Matsuda) has been found after disappearing a few days earlier, but now he is a completely different man, more timid and withdrawn but rather vacant. The touch of amnesia he has extends to basic functions like walking and reading, and asks Narumi to be his guide to learning again. Meanwhile, schoolgirl Akira Tachibana (Yuri Tsunematsu) brutally slaughters her family at their home before calmly walking away in a state of euphoria. When shady tabloid journalist Sakurai (Hiroki Hasegawa) arrives to cover the incident, he lucks upon a major scoop from talking to loitering teenager Amano (Mahiro Takasugi) claiming to be one of three aliens on a mission to understand humans ahead of an invasion. 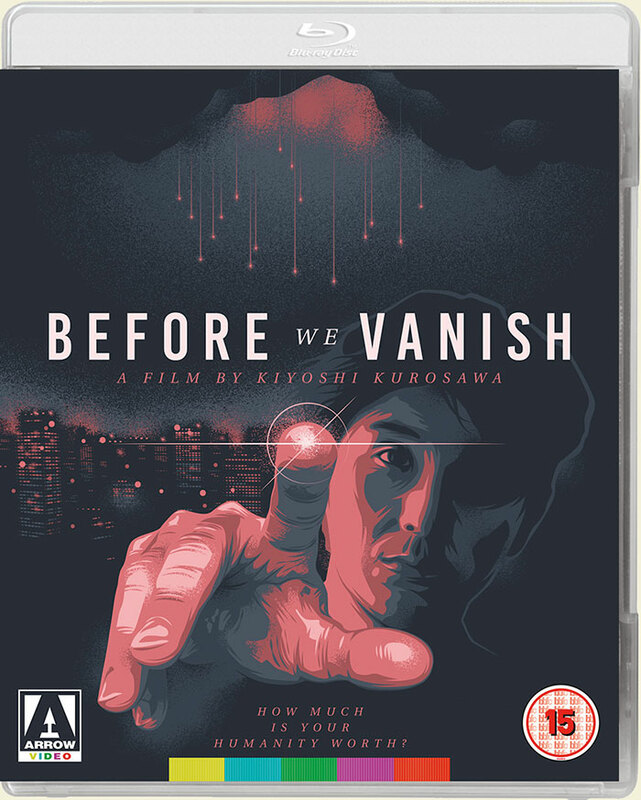 Kiyoshi Kurosawa is mostly known for his psychological horrors and occasional dramas so, to the best of my knowledge, Before We Vanish is his first foray into sci-fi. This isn’t your usual sci-fi flick, which you no doubt surmised from the quote at the top of this review, but it is easily recognisable as a Kurosawa film through his trademark eerie quietness, enigmatic characters, and foreboding sense of doom. Being based on a stage play by Tomohiro Maekawa explains its verbosity and discursive bent, another Kurosawa trait but here he takes full advantage of moving the action beyond the simple single stage structure. This is mostly evident in the final act where Kurosawa indulges in some uncharacteristic special effects laden bombast, along with the touches of lighthearted visual comedy that makes this a hard film to gauge at first. The unique twist about these aliens is that they essentially don’t mean any actual harm at this stage of their plans, their desire to get to know what humans are about and how they operate is comparatively polite to the typical hostility from other alien races. To do this they utilise their ability to take concepts from people so they can experience or understand it for themselves. Shinji gives us our first demonstration of this shortly after returning home, probing his sister-in-law Asumi (Atsuko Maeda) about the concept of family. Shinji asks Asumi to visualise this then touches her forehead with his finger (a’la ET) and literally “takes” the concept from her. Asumi briefly collapses then recovers, now ignorant of the concept of family and leaves the house, telling big sister Narumi where to go! We don’t get to see the aliens’ true forms – which humans are incapable of seeing – so to integrate with us, they take on a host body. If one should expire or prove insufficient, they can simply take another; Akira is at least the third host for her alien, but one she settles for. As the lone female of the group – at least in a host body – she is the most bloodthirsty, quick to kill for thrills and employ the martial arts training she picked up. Amano is far less aggressive but his belief that the invasion and subsequent demise of the human race is fait accompli begets a lack of empathy, assuming the role of observer while Akira racks up the body count. In complete contrast, Shinji is calm to the point of inert but keener to understand pure emotions over reactions, bringing about a complete change of personality from his human host that Narumi begins to fall in love with. Through these naïve explorations of human emotions and social conventions, the aliens become confused because there are no set criteria to the information they accrue. People are different and will have different ideas about things, which makes the setting of Japan an ironic one given how regimented their society is, the script adopting a satirical turn in referencing modern day politics in Japan. But as the contradictions of our language and differing attitudes perplex the aliens, Narumi and Sakurai learn about the dark side of humans when the authorities discover the aliens. This presents a “who are the real monsters?” quandary, revealing how people react when freed from responsibilities and personal ties like work or family, questioning their initial value to us in the first place. Not that this is advocating anarchy and estrangement, instead it holds modern Japanese society to account by demonstrating through extreme examples the benefits and the downsides of social conventions and the importance of flexibility. There is a moment in the coda where a pragmatic doctor (Kyoko Koizumi) sums everything up in a pointed monologue otherwise the message is relayed through more subtle means. Kurosawa is perhaps at his most energetic in his presentation of this film, taking it to the streets and even engaging in bursts of physical activity, from Shinji and Narumi being chased by group of men to Akira’s tightly choreographed fights. Some of the effects in the invasion sequence are a bit iffy but are brief enough not to ruin anything, which might be due in part to Kurosawa leaving his low-key comfort zone. As ever Kurosawa has chosen his cast well, perhaps the most inspired acquisition being Ryuhei Matsuda, whose sharp features, narrow eyes and plain complexion affords him a natural alien-esque blank canvas for a face. Narumi’s journey is the more subtle and redemptive of the two, an incremental path essayed through a graceful and measured performance from Masami Nagasawa. The 130-minute run time and pronounced contemplative approach will be points of contention for some, but Before We Vanish is a quietly compelling and inquisitive film that strikes a deep chord on first viewing, likely to reveal more of itself on future revisits. It’s sci-fi Jim, but not as we know it! Interesting. I love how the original title means “The Strolling Invaders” – like, the aliens are just trying to pass the time! Too bad things like that are lost in translation. But the revised title works as well too and has a deeper significance to the fates of both the aliens and the main humans involved. It’s quite a deep film thematically and in content which makes it such a precious and thought provoking work. Masami Nagasawa and Atsuko Maeda in one package. Their characters left me emotionally moved.